Southside Pawn to Open New Gun Shop May 1st! - What's New! HomeBlogGun Shop NewsSouthside Pawn to Open New Gun Shop May 1st! May 1st is the grand unveiling of Southside Pawn's new, expanded gun store. The new store has a 450 gun inventory, with accessories, holsters, apparrel, ammunition, clips, and scopes filling out the rest of the area. Southside also provides gun transfers for 35 dollars, and are working on a membership plan for their upcoming gun range, for both yearly and day passes. Come check out their competitive pricing and knowledgeable staff of trained gun experts. Their knowledgeable firearms experts will help match their customers to the perfect firearm for their needs. 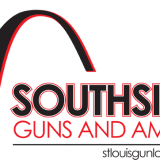 Southside Pawn, with a staff with military and law enforcement experience, current members of the state conceal and carry program, as well as charter members of the NRA, give us a real connection with firearm owners. Each gun is stored unloaded in a safe dry enviorment, preferably in a protective case.Value research is thoroughly conducted on each firearm, so our customers money need can be quickly satisfied. « Gun Loans Through Southside Guns!